← Has Anyone Seen Abe Frohman? Ummm, Denis, have you been playing n the paint pot????? What a luvley foto Mistur James! Wee LUV thee rainbow eefect ALOT!! Mee-you rainbow snuggullin lookss like a pawsum idea!!! Mee mite try that with LadyMum!!! What a sweet picture. It’s nice that your kitties help keep you warm Dennis. Yous are rainbows! Is there a pot of gold nearby? LOVE IT! 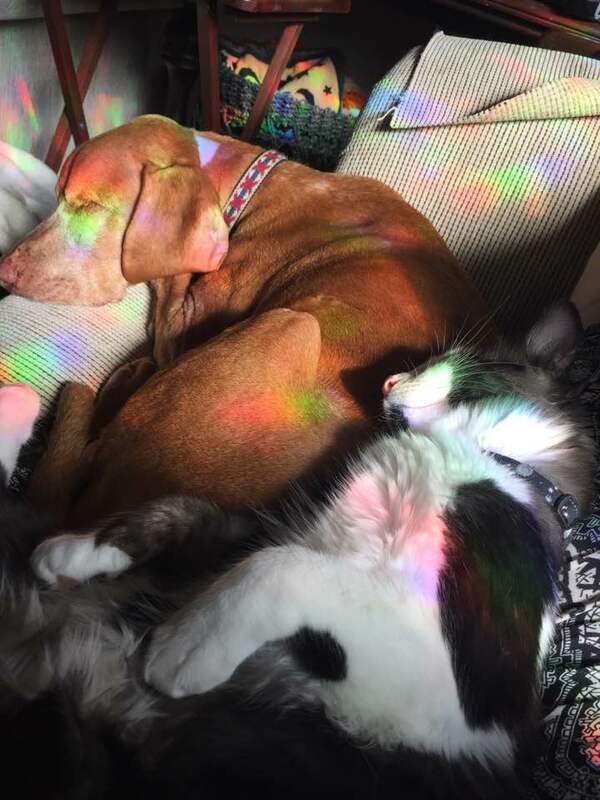 Everyone should sleep in rainbows! For sure you guys! Jan said it best…love it. Ouch, my heart. It can’t take the adorable! Awwww, that is the sweetest! The two of you are most colorful, Dennis! We hope there is a pot of gold at the end of those rainbows for both of you!!! Don’t open an eye, or you will get rainbowed!